All my life I’ve been active and I spent most of my free time outside exploring. As a child I had the privilege of growing up in some beautiful places to roam–California with it’s beaches & mountains, Washington’s lush forests and Michigan’s snow covered hills, just to name a few. My happiest memories are of my adventures discovering new places and stumbling upon hidden beauty, but as I grew older I lost sight of the importance of these explorations and of how good it felt to be active. In the last ten years I’ve renewed my passion for active exploration and I’ve had some great adventures; kayaking the NaPali Coast and hiking the beautiful trails of Waimea Canyon in Kauai, hiking Yosemite, Mammoth Mountain and backpacking to the bottom of the Grand Canyon. There have been incredible trails in New Zealand, Costa Rica and Mayan ruins in Guatemala; not to mention the countless miles of great trails we have right here in our own Santa Monica Mountains. I’ve found that the key to living a full life is to stay healthy. I’ve met people on difficult trails that were in their 70’s—they weren’t letting anything slow them down! The admiration I felt for those people was a big part what inspired me to become a trainer. I’ve had too many friends tell me they’re ‘too old’ to get in shape– and they were only in their 30’s! I wanted to show others that being active and strong can be one of the pleasures in life – not just another chore on our “To Do” list. 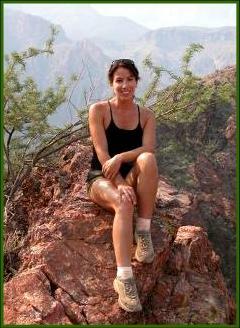 This is me on a side hike near the bottom of the Grand Canyon. What a great trip!